Mix all ingredients except ground beef in a bowl. Once combined add the ground beef and mix until fully incorporated. Split the meatball mixture into two patties and pat out to an even size. Place sausage in the center and roll the sides around and form around the sausage evenly. Wrap one piece of bacon long ways around the ends meeting in the middle, then wrap the next four slices around until the bomb is completely covered. 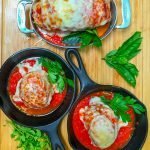 Bake on a raised baking rack for about 1 hour at 380 degrees F.
Place bomb in a oven safe pan or mini cast iron , top with ¼ cup marinara on each one, two slices of provolone and a tablespoon of Parmesan. Broil for 3-5 minutes until Cheese is melted.